Warning: Discharging firearms in poorly ventilated areas, cleaning firearms or handling ammunition may result in exposure to lead and other substances known to the State of California to cause birth defects, reproductive harm and other serious physical injury. Have adequate ventilation at all times. Wash hands thoroughly after exposures. 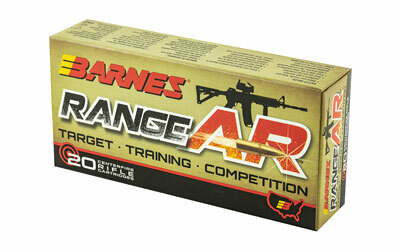 Introduce your AR to legendary Barnes precision: Barnes RangeAR Ammunition for Target, Training and Competition. 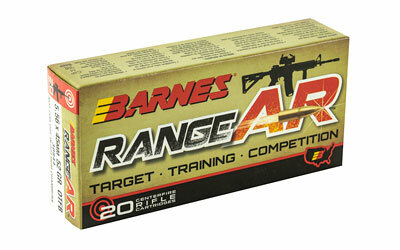 For those seeking ammunition that performs consistently, Barnes RangeAR Ammunition delivers higher velocity, flatter trajectory and ultimate accuracy at an affordable price. 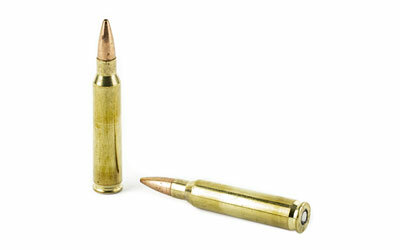 First quality factory-fresh brass is paired with a lead-free, copper-jacketed, zinc core OTFB (Open Tip Flat Base) projectile. 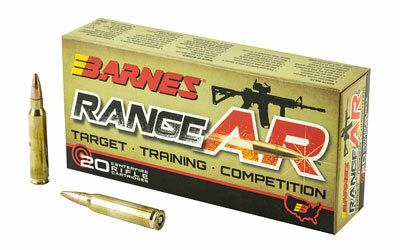 The robust zinc core provides excellent performance in AR’s with quick twist barrels. Specialized propellants optimized for AR’s ensure that RangeAR Ammunition offers superior performance in these high performance platforms of any barrel length. As an additional bonus, click on the QR code located on the back of each box to view drop tables for a variety of barrel lengths specific to each load.